[By Nick] It’s time to bring the kefir excursion to a close. The last (free) product they sent me is a part of their Frozen ProBugs Frozen Kefir line which, as you can tell, is marketed towards children. Well, the children of health nut soccer moms anyway. 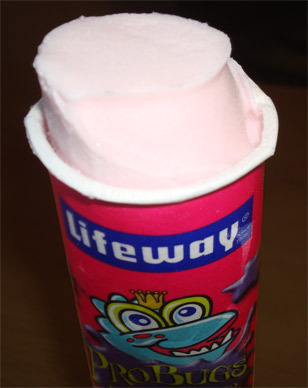 These seem to be Lifeway’s version of Yoplait's Go-Gurt, the only difference is that Lifeway has a regular version and a frozen version while General Mills says you can either refrigerate or freeze go-gurt. The sample I received is their Goo-Berry Pie flavor but these also come in Strawnana Split and Orange Creepy Crawler. Like all of Lifeway’s products, these are packed with all sorts of nutrients. This one boasts that it is an excellent source of protein and calcium. Now what exactly is Goo-Berry Pie? Well my first guess was blueberry seeing as “goo” and “blue” rhyme. Well looking over the ingredients list, I was right and this is in fact just blueberry frozen kefir. 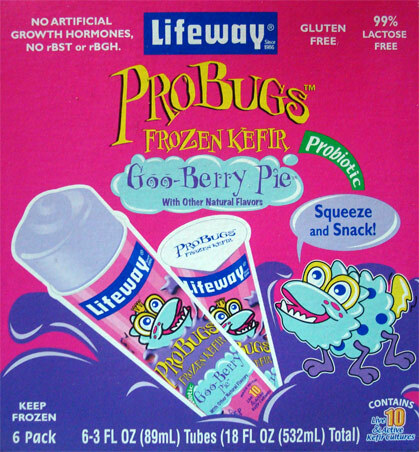 The weird thing to me is that Lifeway doesn’t actually make a frozen blueberry kefir in their pints selection. Not sure if that’s supposed to mean anything for taste but I guess I’ll just have to find out. The packaging is eye catching to say the least. The pink box contrasted with the varying shades of blue would make me stop in my tracks in the frozen isle. The little creature is kind of cute in a “I think I drew something similar to that in elementary school” kind of way. Still I give Lifeway props for making an appealing looking package. Time to get one of these buggers (pun intended) out of the box. Well that reference to Go-Gurt was a bit off. The package reminds me of the icy fruit thing they’d give out at lunchtime in grade school albeit a thinner, longer version. Hey look, the creature is now wearing a crown! He’s moving on up in the world. Taking off the seal and it looks like a cute little version of their pints. I’m not sure why but that made me smile. The container says to enjoy right away by running under luke warm water for 8-10 seconds. Well seeing as this product has been out a bit to get photographed and such, I’m just going to skip the whole running it under water thing. Squeezing this one out, it now starts to remind me of those old push up pops. Wow this stuff is conjuring up way too many nostalgic memories. As for taste, well it doesn’t taste like any blueberry I know of, it’s just kind of that generic “berry” flavor with an added bit of tang. It’s not offensive but after having them be spot on with most of their other kefir flavors, I was a bit disappointed. I wanted something similar to the taste of fresh blueberries, not some generic flavor that was bearing on the side of artificial. I guess I could see kids liking this though so there’s that for a plus. 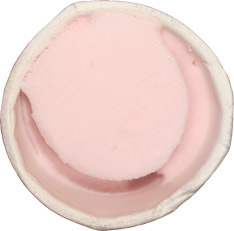 The texture is just like the kefir in the pints, creamy and dense. It easily squeezes out of the little container but when the edges of the top get wet, some of the paper actually broke off into the kefir. Let’s just say picking paper out of your mouth is not a good time. I can’t see myself wanting to try their other varieties seeing as I’d much rather eat their kefir with a spoon rather than squeezing it out of a tube. Still if you’re a parent who wants to incorporate some added nutrition into your child's diet, I wouldn’t think they would object to trying these. I mean, come on, the little monster on the front would have me sold if I was little again.